This project started back in the summer with a little stroll through my local Costco. They had a set of bathroom hardware for an amazing price. The set included a 24" towel bar, toilet paper holder, double robe hook and a ring towel holder. And a little voice in my head told me to redo one of the bathrooms at my mom and dad's house as a gift. My mom and dad built this house in 1990. When I was younger we used it as a weekend house and then when my parents retired in 2005 they moved in permanently. This is the second full bath on the second floor and my parent's have their own ensuite bathroom so this one is now a guest bathroom. For the record, I offered to makeover the ensuite but my mom wanted the guest bathroom done first. So typical that we focus on updating the "public" spaces of our homes before the ones that are just ours. All of the major fixtures are original. There have been a couple of coats of paint over the years, an update to the lighting, the builder mirror and the faucet but that is about it. The bathroom still features the original vinyl floor, almond tub and surround, toilet and sink, laminate countertop and oak vanity with the original pulls. Here are some pictures of the bathroom before our makeover. A whole lot of beige going on in there! But everything is in good working order which makes a makeover way more sensible. 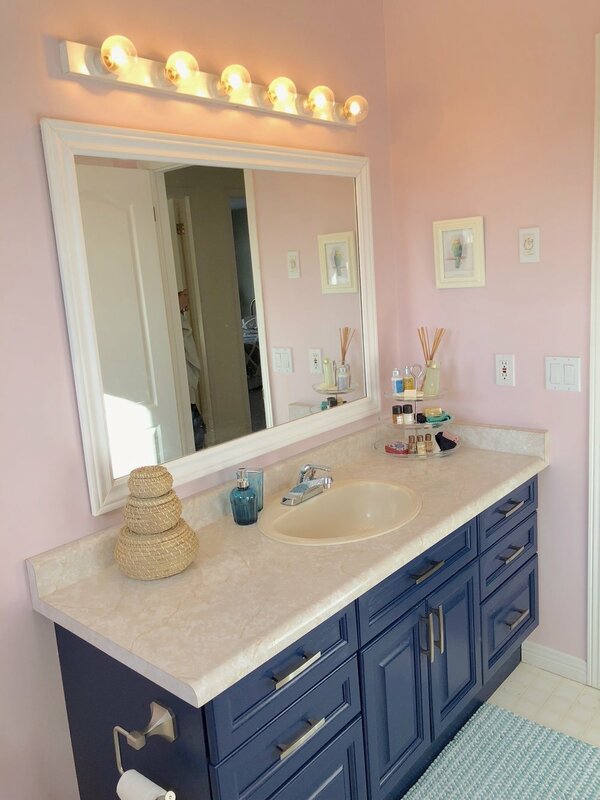 My first job was to find a way to cut out some of the beige and make the almond fixtures and vanity seem a little more modern. Every fixture that is nailed or glued down is staying so I really only had paint and accessories to work with but when you see the after shots, I think you will agree that those can be very powerful tools in any project! And because I am so excited to show you how it turned out, I am going to cut to the chase and do that now! BOOM! That folks is the power of paint and accessories! I looked all over for advice on how to make almond fixtures blend and found some great colours out there but they all still trended towards the beige/grey side and I wanted to do something a little different. One thing I knew for sure was that I wanted to paint the vanity navy blue. The next thing that happened was I found that amazing shower curtain at H&M. And then the pink just fell into place. 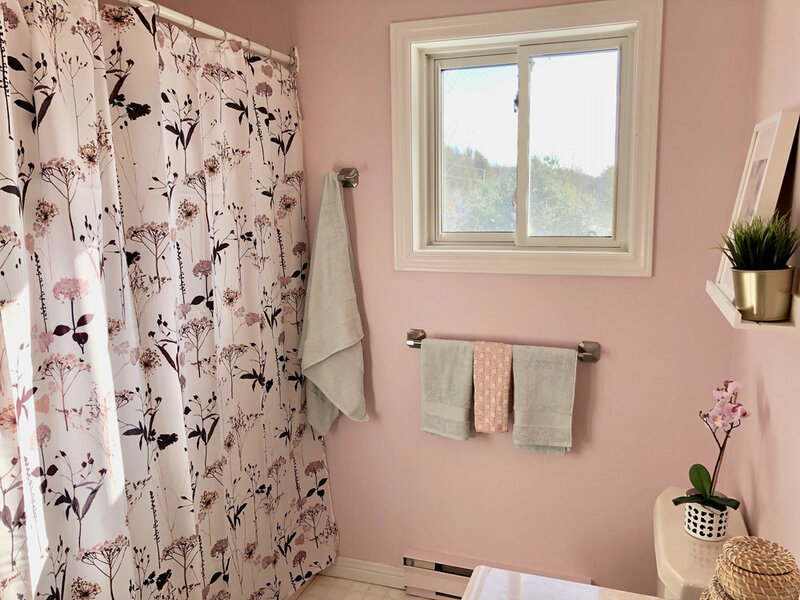 I looked at the flowers in the curtain and pulled a soft pink (Demure from Sherwin Williams SW6295). The new towel bar, toilet paper holder and robe hook installed perfectly, new pulls for the vanity, new bathmats and towels and a trip to Ikea for accessories et voilà! A beautiful new/old bathroom. And to add to the amazing-ness that is this bathroom? This makeover took me 1.5 days to complete and cost $380! I've included a list of my items/sources below. And the second best part about this project (after having a beautiful bathroom that my mom really loves) is that it has inspired her to update the other 2 bathrooms! 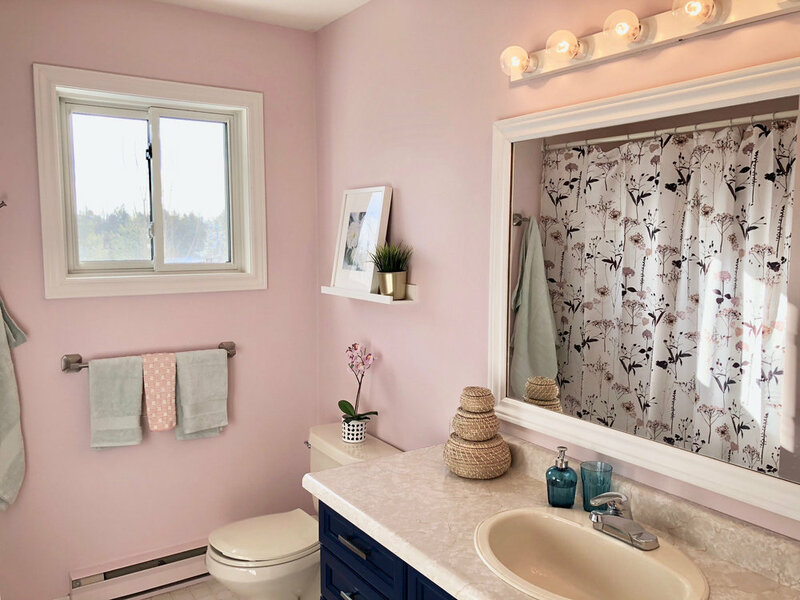 She has her ensuite and a powder room and she is looking at painting those vanities too and adding some other new touches. Let me know in the comments what you think and all the best for 2018!